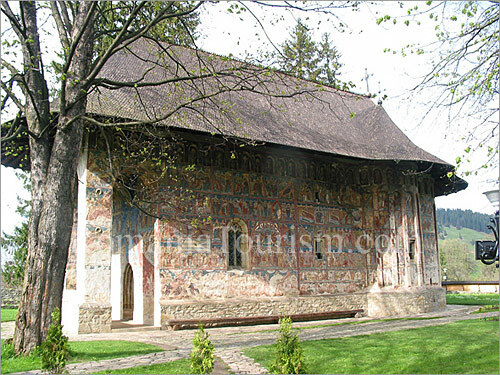 Founded in 1530, Humor (Hoo mor) is rather small, physically, but it looms large among Bucovina’s treasures with a variety of frescoes dating from 1535, including one illustrating the Return of the Prodigal Son and one with a “humorous” depiction of the devil as a woman. The church, topped by a cross-shaped shingled roof, is without a steeple, indicating that it was built by a court official rather than a prince. The predominant hues of the frescoes are reddish brown with some rich blues and green infusions. An extremely valuable collection of icons from the 16th century is displayed in the monastery.